1,131,700 inhabitants; the metropolitan area has 1,566,000 inhabitants. 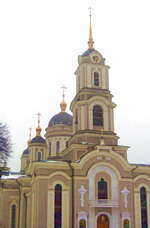 It is the fourth-largest city in Ukraine. Donetsk and the surrounding territories are heavily urbanized and agglomerated into conurbation. The workforce is heavily involved with heavy industry, especially coal mining, but the city is very green and lightly polluted for being a major industrial city. Donetsk has one of the highest standards of living in the region.